Advanced Realtime Systems, Inc. (ARS) products use the “ARS Generic Distributed Real-Time Software Architecture” (ASA) technology allowing developers to quickly “plug-in” applications into a self-contained, high-performance, fully-featured, “out-of-the-box” distributed real-time control system infrastructure. In addition, ARS products can support a company's already deployed "legacy" systems (not running ARS products). This can save tremendous amounts of software development effort. ARS's revolutionary, high-performance technology and products are backed by a world-wide track record of proven in-field successes. They allow you to quickly and easily develop totally portable and scalable distributed real-time applications. You need never worry about computer operating systems, network communication protocols, computer programming languages, or even your customized hardware platforms. Customers are freed to do what they do best - focus on their applications! ASA is a state-of-the-art, platform independent technology that allows application software "plug-and-play" interoperability over a diverse computing environment. The ASA infrastructure provides real-time control transparency, allowing applications to work together seamlessly within any complex, mission-critical distributed real-time system. ARS products are designed to meet the needs of high-performance applications within the automotive, medical, financial, military, aerospace, cellular, and industrial markets. 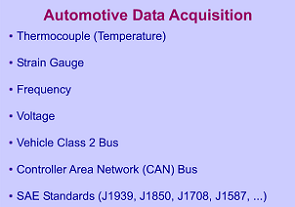 ARS products have been specifically developed for use in the automotive data acquisition industry. They can eliminate years of complicated, high-risk software effort when collecting signal conditioning data from transducers such as thermocouples (for temperature), strain gauges, frequencies, and voltages. RTC/MLTnet can also help you communicate and collect data with devices on a Vehicle Class 2 bus or CAN bus. Finally, ARS products can make data acquisition simple when using higher-level SAE standard protocols. 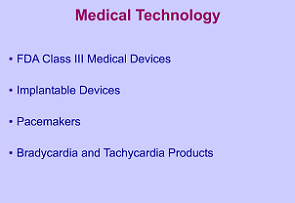 ARS products have been specifically developed for use in the medical technology industry. They can eliminate years of complicated, high-risk software effort when developing FDA Class III medical devices. They can also help you communicate and collect data with implantable devices, such as pacemakers. Finally, ARS products can make data acquisition simple when building devices for monitoring Bradycardia and Tachycardia products. 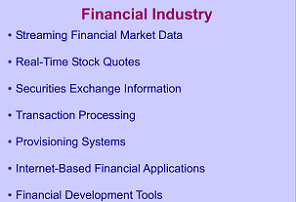 ARS products have been specifically developed for use in the financial industry. They can eliminate years of complicated, high-risk software effort when collecting or streaming financial market data, such as real-time stock quotes or securities exchange information. They can also help you communicate and collect data for real-time transaction processing and provisioning systems. Finally, ARS products can make data acquisition simple when developing Internet-based financial applications and financial development tools. 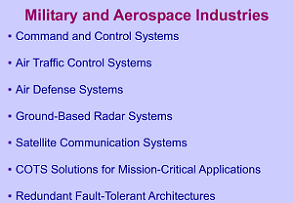 ARS products have been specifically developed for use in the military and aerospace industries. They can eliminate years of complicated, high-risk software effort involved in developing command and control systems, air traffic control systems, air defense systems, ground-based radar systems, satellite communication systems, and other military applications. ARS products provide “off-the-shelf” solutions for your mission-critical real-time embedded applications, addressing the most complex, redundant fault-tolerant architectures. ARS products have been specifically developed for use in the cellular technology industry. They can eliminate years of complicated, high-risk software effort involved in developing cellular communication systems, wireless data networks, mobile computing and Internet applications, hand-held device products, and other telecommunication applications. 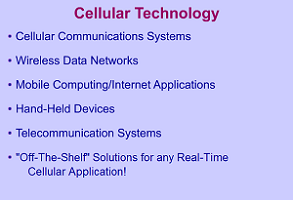 ARS products provide“off-the-shelf” solutions for use in any real-time cellular technology system. ARS products have been specifically developed for use in many industries, beyond just the automotive, medical, financial, military, and cellular technology fields. RTC/MLTnet can eliminate years of complicated, high-risk software effort involved in developing process monitoring and control systems, factory automated instrument control systems, television broadcast control systems, point-of-sale terminal systems, real-time simulation systems, detection systems, and any other real-time embedded application. 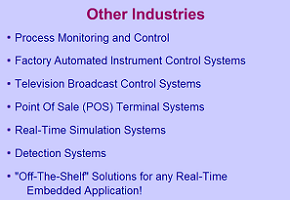 RTC/MLTnet provides “off-the-shelf” solutions for use in any real-time industry. For additional information, please contact products or submit an on-line request for additional information. "I am writing this testimonial because I know what RTC/MLTnet can do. Besides meeting all of our stringent real-time performance requirements (less than 1ms fidelity across our distributed system and custom hardware), I estimate that using this product saved us several hundred thousand dollars in development costs, test costs, and especially debug costs. Five years after delivery, our mission-critical Phased Array Radar system, built for the United States Air Force, is in continuous use, 24 hours/day, at Peterson Air Force Base here in Colorado Springs."